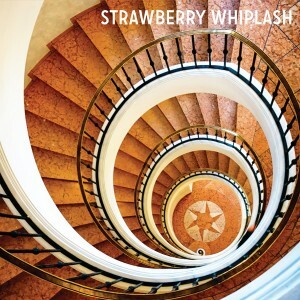 Long awaited sophomore release from Scottish fuzz pop enthusiasts Strawberry Whiplash! Three years following the band’s smash debut album ‘Hits In The Car’, the eclectic new 12-track album ‘Stuck In The Never Ending Now’ has the inexorable passage of time as its central theme. Opening track ‘Every Day The Sun Shines Brighter’ starts things off in optimistic fashion with a melodic song about new beginnings, while ‘If Surface Were Depth’ is catchy, playful pop and ‘Too Close To Call’ is a harmonious, multi-layered soundtrack to an indie spaghetti western. ‘Never Ending Now’ is immediately engaging punky pop with scratchy, fast guitars, more great harmonies, and rapid gunfire drumming. ‘Ride The Waves To The Shore’ has a shimmering, bossa nova beat with major seventh chords and groovy bongo backing, while ‘Time Takes You Away’ is all late night New York cool with chugging guitars and a Velvet Underground vibe. Side two kicks off with the album’s fastest track ‘Halcyon Morning’ providing us with a future indie disco floor filler with C86 fuzzy guitars, a steady drumbeat, and tambourines all racing towards the song’s instrumental coda. ‘All I Ask For Is Everything’ furthers the eclectic mix with a chiming guitar / glockenspiel blend and an incessant back beat reinforcing the selfish nature of the song, while ‘Fly Me Over The Rooftops’ is soaring, immediate pop with detached male backing vocals. ‘A Brave New Scene’ is elegant, multi-layered pop that twinkles and chimes in all the right places, while the funky bass line in ‘Life’s Rich Tragedy’ breaks right through the fourth wall in this musical romp involving an unfaithful method actor in need of direction on stage and in his life. Finally, the album’s poignant swan song ‘This Is All We Have’ opens with an autumnal oboe motif and adds some shimmering guitars before reaching peak loveliness. Reflective and optimistic, ‘Stuck In The Never Ending Now’ is twelve more hits from Strawberry Whiplash and an additional Scottish pop classic for the Matinée discography.